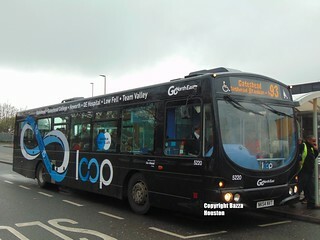 In a bid to improve the internal quality standard of the "Red Arrows" branded Wright Eclipse Gemini 2 bodied Volvo B9TL allocation, this vehicle has undergone a minor in-house mid-life refurbishment by having its seats re-trimmed into Go North East's standard blue 'Go' moquette. Though originally intended to return to service at Washington on 9th August 2017, the diversion route continued on until this day due to the works on the Washington Highway being continued into this day. As such, a day later than expected, this vehicle has now returned to service at Washington, with the "Red Arrows" X1 service returning to the route it usually operates. This vehicle has transferred from Washington Depot to Chester-le-Street. While this vehicle is allocated to Chester-le-Street Depot; it should be allocated to services 13/X25, which will allow a fleet livery Wright Solar bodied Scania L94UB to temporarily transfer to Washington Depot. 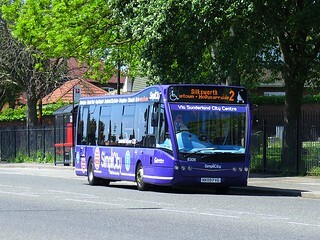 These temporary transfers coincide with a short notice road closure by Sunderland City Council, which means that northbound buses on "Red Arrows" service X1 are unable to run direct along the Washington Highway on 7th and 8th August 2017, and will need to be diverted along Bonemill Lane, via Fatfield Bridge and Station Road to Shiney Row. Due to the low bridge in the area, double-deck vehicles cannot be allocated to the X1 service during this time. 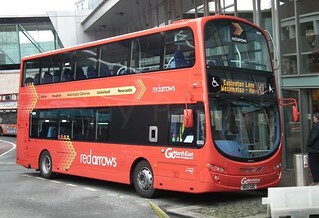 Having previously carried "Red Arrows" branding, this vehicle has been repainted into a plain red base livery. This vehicle has entered service at Washington Depot. 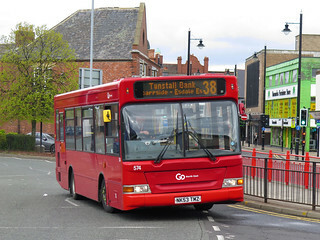 Ahead of its entry into service, this vehicle has received "Red Arrows" branding, with sub-branding for service X1 (Easington Lane - Newcastle). This vehicle, which carries a red base livery, has arrived into the Go North East fleet. Equipped with free Wi-Fi and Next Stop Announcements, this vehicle is currently being prepared for service at Saltmeadows Road Depot. 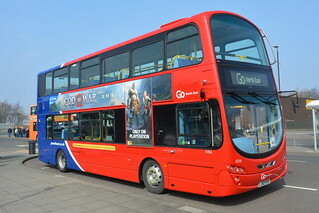 Once prepared for service; it will be allocated to Washington Depot for use on "Red Arrows" service X1, displacing the remaining single deckers allocated. Ahead of upcoming service changes, due to commence from Sunday 22nd May 2016, which will see "SimpliCity" service 2 reduced to a 15-minute frequency, this vehicle has had the frequency on the cant rail revised to reflect the new frequency. Serving as a replacement for Transbus MPD/Transbus Mini Pointer 570 (NK53 TMU) which was withdrawn having sustained defects uneconomical to repair, this vehicle has transferred from Riverside Depot to Deptford.